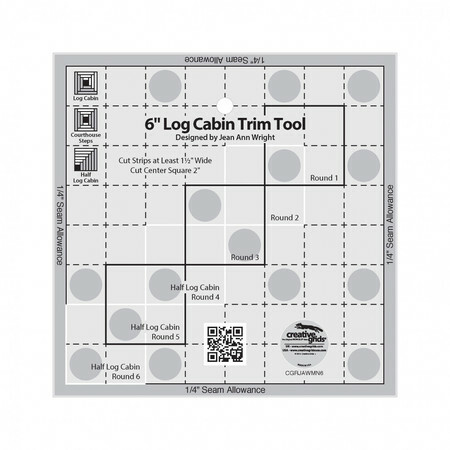 By designer Jean Ann Wright, this 6" Log Cabin Trim tool allows you to trim your log cabin block as you sew. Create perfect log cabin, half log cabin and courthouse steps. Simply place the appropriate centering square on the ruler over the 2" square and trim after adding each log. Equipped with Creative Grid's exclusive grip, this ruler slides easily on fabric yet stays in place when pressure is applied. Use the included instructions or scan the QR code to view a video demonstration. Made in the USA.